Coaches and players at an Asfordby football club have launched a fundraising campaign after burglars broke into their storage premises and stole balls, boots and shin pads worth £800. The raiders used a crowbar to break into the container at Asfordby Amateurs Ladies, Girls and Inclusive Football Club (AALGIFC) in the early hours of Sunday November 16. They took 40 brand new uninflated pink training balls and several white Nike Strike match footballs, which together are valued at around £600. In addition, brand new Mitre shin pads and many pairs of football boots, which were donated to the club as part of a swap shop initiative to help players avoid the cost of buying brand new kit, were also stolen. The club, which has 110 players aged from four upwards and has been running for 20 years next year, say the cost of losing this kit was ‘a significant blow’ and it would be difficult for them to fund the money to replace it. So they have now started an online fundraising campaign to try to raise the funds. 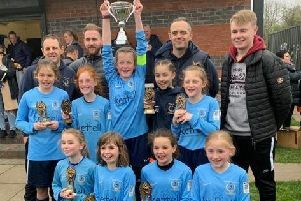 Leah Radford, who coaches the club’s Under 12s and the ladies’ senior side, said: “This has been very disappointing and upsetting for everyone at the club, especially the way they turned the storage area over and left it in such a mess. “We have tried to shield the younger girls from what has happppened but the parents are really angry about it. Club spokesperson Caroline Hewitt said: “This break-in does not only affect our club, but the whole local community. The club promotes football for girls in the wider community, and it also works closely with schools to offer free coaching sessions for girls, as well as inter-school tournaments and fundraisers for local causes. Go online at www.justgiving.com/crowdfunding/aalgifc to make a donation to help replace their stolen balls and kit.